Today’s architecture and construction industry is more focused on sustainability than ever before. Across the board, designers and specifiers are seeking construction materials and methods that carefully balance performance, aesthetics, and minimal environmental impacts. As the sustainability movement continues to gain momentum, the sustainability credentials of products have become a critical deciding factor for consumers; in response, many manufacturers are keen to emphasise the environmental performance of their products in the hopes that this will drive sales. As Chuck Hostovsky of the University of Toronto writes, however, the sustainability movement does have one unintended negative side effect: greenwashing. Greenwashing, or the tendency for manufacturers to over state the environmental performance of their products, is rife, writes Hostovsky. Many products are now marketed with tags of “sustainable” and “ecofriendly” without any information to verify or back up these claims. Against this backdrop, it is critical that designers and specifiers take manufacturer’s claims with a grain of salt, and instead look for third party specification by independent bodies. All products from flooring experts Tarkett are accompanied by extensive, easily verified third party certification that reflects a genuine, ongoing commitment to transparency and environmental sustainability. Tarkett’s diverse range of homogenous and heterogeneous flooring and wall linings and carpet tiles is designed to meet – and in practice, often exceeds – the requirements of a number of major local and international environmental standards. The majority of Tarkett flooring and wall products have extremely low VOC emission rates, and are CodeMark certified for wetroom use. Green Star is the paramount environmental certification of the Green Building Council of Australia. Since 2003, the Green Star certification program has recognised nearly 2000 projects across the nation for their achievement of outstanding environmental efficiency and contribution to healthy, sustainable spaces. 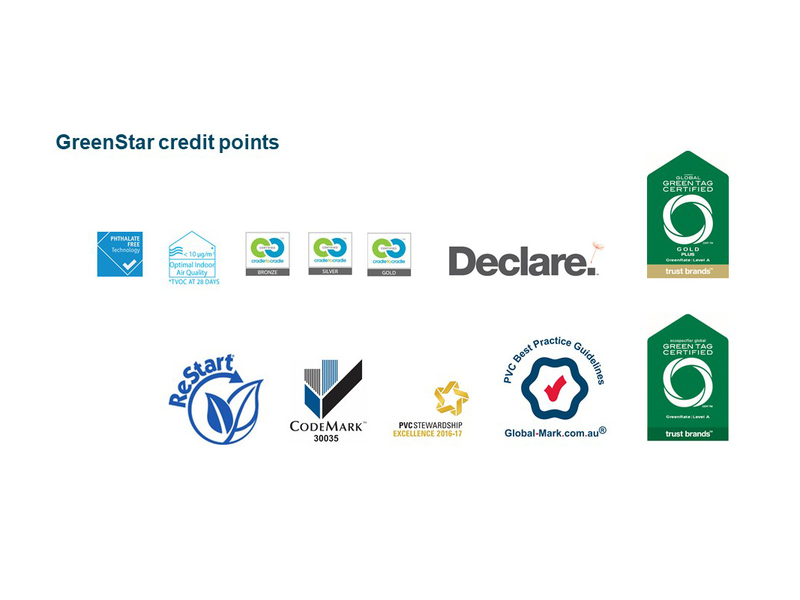 Green Star certification is on a credit point basis, and can be achieved by first meeting the requirements of other, product-specific certifications such as GreenTag and LCARate™. More than 30 Tarkett products are GreenTag Level A and LCARate™ Gold Plus rated, which can significantly increase credit points and help a project secure Green Star Certifcation. All Tarkett products can make valuable contributions to meeting international WELL Building Standard credit point benchmarks, with supporting documentation and certification specifics available on request. Leadership in Energy and Environmental Design (LEED) is a rating system developed by the United States Green Building Council to assess the overall environmental performance of a building. Like the Green Star scheme, LEED certification is achieved on a credit point basis. A large number of Tarkett products can aid in achieving LEED certification. However, this is dependent on the certification type, environment, and requirements – for more information and supporting documents, contact Tarkett. Cradle to Cradle, or “C2C” certification, assures consumers that a product maintains high environmental performance standards from the manufacturing stage through to its post-use life. Five levels of achievement are awarded (Basic, Bronze, Silver, Gold, or Platinum) in five different performance categories: material health, material utilisation, renewable energy and carbon management, water stewardship, and social fairness. Three Tarkett carpet tile lines are C2C certified: the Desso SoundMaster acoustic carpet tile, Desso EcoBase recyclable carpet tile, and DessoProBase. The Tarkett catalogue also includes C2C certified ranges such as iQ One, a non-PVC homogenous flooring that is the first homogenous product to achieve Gold certification. Manufacturers may submit their product to International/Australian Living Future Institute (ILFI) to obtain a Declare certificate. The ILFI assesses building materials against their Red List which contains the worst in class materials prevalent in the building industry. Only Declare certified products can be used in projects that want to achieve Living Building certification. Tarkett iQ One, Linoleum XF2 and Tandus Carpet Tile and Powerbond with Ethos backing are Declare certified.